In the day and age of social media, fans around the world became instantly aware of how stunning the show was. Immediately, people began asking that it become a nighttime spectacular here in Los Angeles – and it seems that Universal actually agreed/listened, moving forward with plans to bring a shorter, more doable version of the show to Universal Studios Hollywood almost right away. 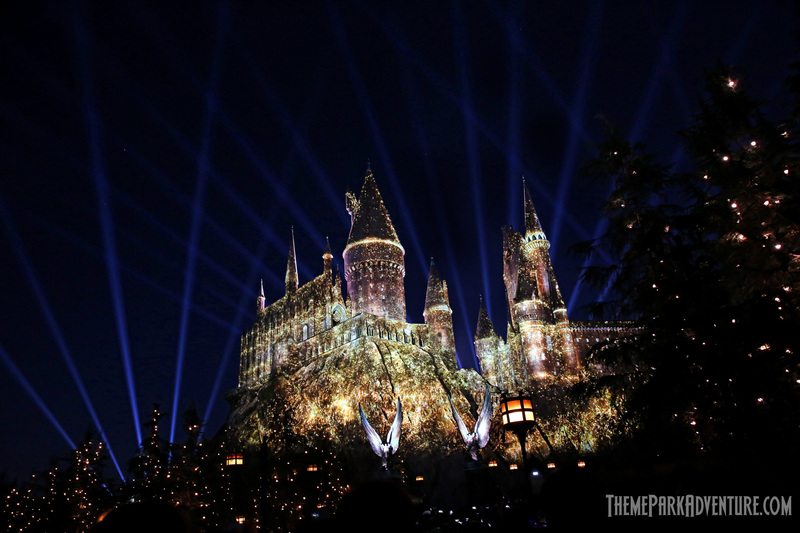 This week, The Nighttime Lights at Hogwarts Castle officially debuted at Universal Studios Hollywood after several weeks of “soft open” technical rehearsals that could be seen across much of the San Fernando Valley each night. Guests have been dazzled by the show, which is a truncated version of the grand opening show, but just as visually thrilling and executed beautifully with scores of state-of-the-art projectors, a sound system that is very impressive, and a musical score conducted by the prolific William Ross – recorded in London with the London Symphony Orchestra. That in itself is impressive – Universal definitely spent some legit cash on this project to get it done correctly, and everyone in the know certainly appreciates it. Each night after dark, guests can expect to see The Nighttime Lights at Hogwarts show presented several times, park hours permitting. The show itself isn’t long at all – less than 5 minutes, actually. However, crowds do get heavy in the half hour or so leading up to the first performance of the night. A pro tip may be to wait and see the second or third – even fourth presentation, if the park is open late enough. The first performance is always the most crowded; the last is definitely the most enjoyable if you don’t want to be elbow-to-elbow with people in the viewing area. And where is the best viewing area for the show? We’ve seen it numerous times from just about every vantage point in Hogsmeade. It is our opinion that the Nighttime Lights at Hogwarts Castle is best viewed in front of the area stage where the Frog Choir and Triwizard Tournament shows take place during the day. Team Members won’t let guests stand on the stage itself, but guests may be allowed to sit or stand on the steps, depending on how crowded the viewing area itself is. 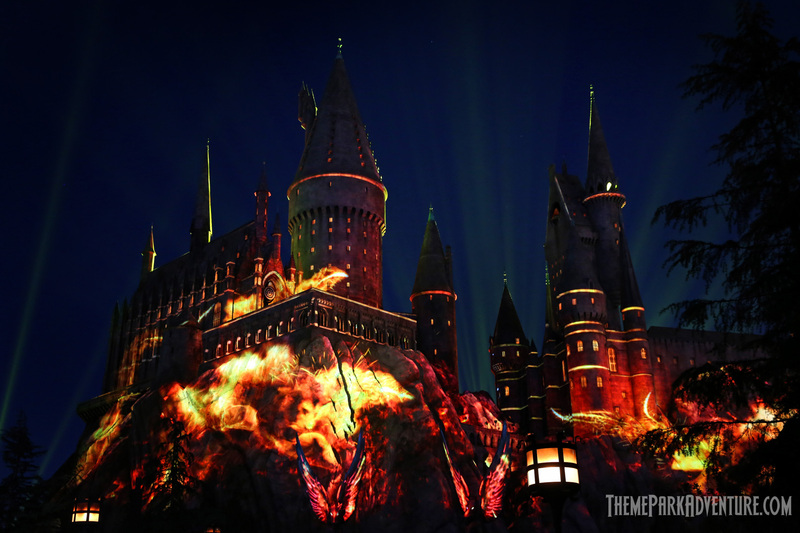 Each of the “houses” are represented during the Nighttime Lights at Hogwarts show – Gryffindor, Hufflepuff, Ravenclaw, and Slytherin. 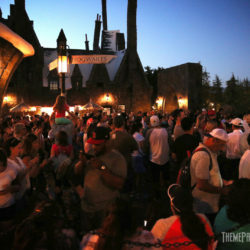 It’s fantastic fun to hear fans hoot and cheer when their given house is singled out during the show – an intended audience engagement that works flawlessly each time, really lending itself to the sense of community Potter fans share so well in the theme park and beyond. 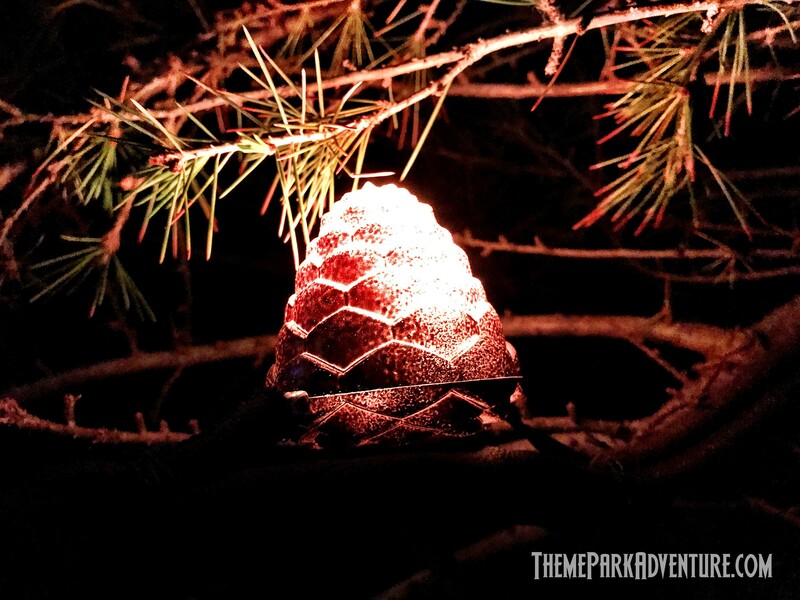 An added touch that was unexpected and really cool, are the addition of hundreds – if not thousands – of small LED bulbs disguised as pinecones nestled in the pine trees throughout Hogsmeade. By day, they are all but invisible. 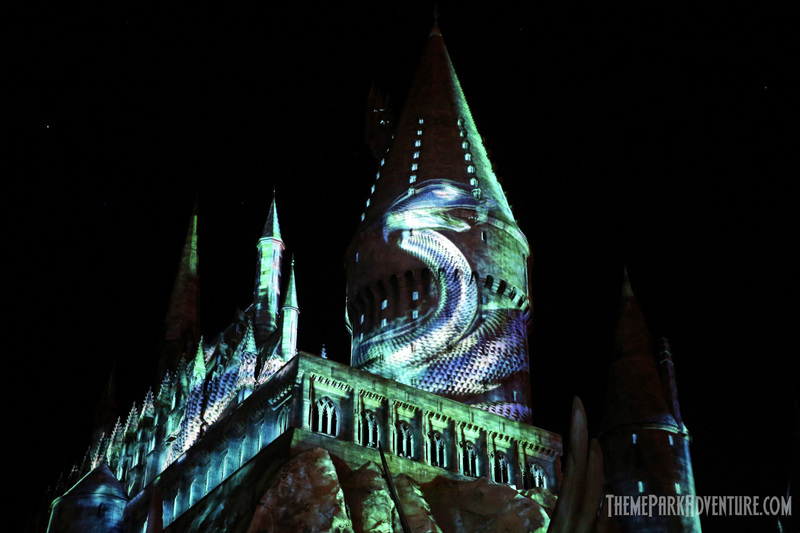 During the Nighttime Lights at Hogwarts show, they bring the land to life with an extra layer of colorful, ambient lighting. This is a touch that honestly, Universal didn’t need to add; but they did, giving the overall show a more dynamic presence. Now, it is dimensional for guests, surrounding them as they experience the show. Since the lights are programmable, it is definitely something that Universal is going to continue using going forward to enhance perhaps new, seasonal projection shows coming in the future. 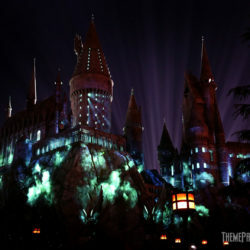 Future shows are definitely something that fans should keep an eye out for, considering a Christmas overlay has already been announced for Potter at the Universal Orlando Resort, and the Expecto Patronum Night Show at Universal Studios Japan features live actors, practical special effects, and a projected Dementor attack on Hogwarts that is really pretty impressive. While nothing has been officially announced beyond our current show here in Hollywood, I’d venture to guess that new and exciting productions using the hardware that is now in place are sure to come in the months and years ahead. 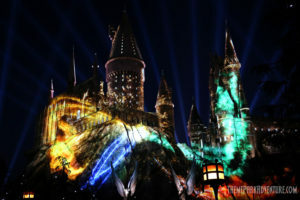 Kudos to Universal for hearing the fans and giving The Wizarding World of Harry Potter the kiss goodnight it deserves! It’s exciting to watch this new land really mature and grow into one of the most impressive and inspiring theme park additions in the world. We look forward to more magic to come in the future! This entry was posted in Features, Home Page, Home Page Slider, News and tagged Rick West, The Nighttime Lights at Hogwarts Castle, The Wizarding World of Harry Potter, Universal Studios Hollywood. Bookmark the permalink.